They might not be underdogs, but Phantoms cannot be classed as one of the big fish swimming in the English Premier League ocean either. That is the message from trophy-winning coach Slava Koulikov as he gears up for his second full season in charge of the city club. Koulikov brought back the glory days by guiding Phantoms to play-off success last season, but he delivered a typically under-stated assessment of the club’s position ahead of the 2015/16 puck-drop this weekend. “We are not underdogs anymore,” admitted Koulikov, who penned a three-year contract with new owners Dave and Jo Lane in the summer. “But we are not a big team by any means either. “I can split the league into three groups. There are the big teams who expect to win things and spend a lot of money to try to do that. “Then there is the mid-pack who look to challenge those bigger sides, and finally there are those teams fighting at the bottom. “With last season under our belts, I believe we have moved into the mid-pack after previously being one of the teams fighting just to try to make the play-offs. “Of course it is not always the biggest names and the most money that make the best teams. We proved that last season and we will try to do it again. “We have some young talent, we have a lot of experience and we have the best netminder in the league. I can’t say whether or not it is a better team than last season, but I know I have a group of players who want to build on what was achieved. “What I can say for sure is that the league is stronger again this season. There are new British players, new imports and an extra team in Hull. “Last season the goals were to make the play-offs and compete with the top teams. We managed to do both of those things and they will be the targets again. Double-winners Telford are again likely to be the team to beat. The big-spending Tigers roared to title glory and added the EPL Cup to their collection before seeing their hopes of a treble ended by Phantoms in the play-offs. “Telford won the league by 16 points last year and I would have to say they are hot favourites again,” continued Koulikov. “But, looking at the rosters, I think they could be pushed closer this season. “I expect Milton Keynes to be a stronger team under their new coach and the same applies to Swindon. 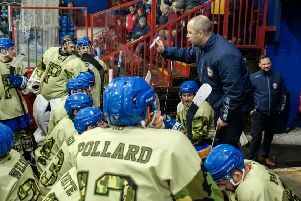 “Basingstoke have drafted in an import goalie, which is something that has worked well for us, while Guildford have had a bit of a clear-out and brought in a lot of new guys. “I feel our pre-season has been successful and I think we go into the new season in a good place. Phantoms face a tough opening weekend as they go to Swindon (a team they overcame in the play-off quarter-finals last season) on Saturday (5.45pm) before entertaining Basingstoke at Planet Ice on Sunday (5.30pm).